Law Web: How to ascertain that death was due to strangulation or due to drowning? 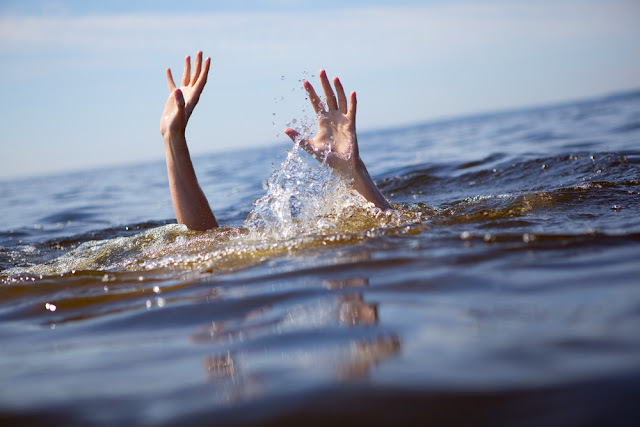 How to ascertain that death was due to strangulation or due to drowning? According to Modi's Medical Jurisprudence and Toxicology 'strangulation' is defined as the compression of the neck by a force other than hanging. 'Ligature strangulation' is a violent form of death, which results from constricting the neck by means of a ligature or by any other means without suspending the body. When constriction is produced by the pressure of the fingers and palms upon the throat, it is called as throttling. In such case death is usually due to asphyxia. Appearance on the neck may vary according to this means used. It is also indicated, if fingers are used (throttling), marks of pressure by thumb and the fingertips are usually found on the either side of the windpipe. The thumb mark is ordinarily higher and wider on one side of the front of the neck, and the finger marks are situated on its other side obliquely downwards and outwards, and one below the other. However, the marks are sometimes found clustered together, so that they cannot be distinguished separately. These fingertip bruises, each disc-shaped and 1-2 cm in diameter, look like red bruises (six penny bruises) if examined soon after death, but they look brown, dry and parchment like sometimes after death. 8. We have already stated the external injury appearing on the neck noticed by the Doctor during postmortem examination. Besides bruises, vomits was present over nose and mouth. Hemorrhage in subcutaneous tissues of neck beneath bruises. The finding of the Doctor appearing in the postmortem report clearly suggests that death was due to asphyxia as a result of strangulation. Though, learned counsel has not put any question to the Doctor but after going through Modi's Medical Jurisprudence and Toxicology and the evidence of the Doctor, it was not at all a case of accidental fall in the water and death due to asphyxia as a result of drowning. If a person will accidentally fall into well, he must sustain other injuries like abrasion, may be haematomas if any part of the body cause dash with any hard substance of the well. In a case of dry drowning, the injuries which the Doctor has noticed on neck and on dissection of head and neck shall never occur. Besides the medical evidence if a person will go to fetch water from a well and fall accidentally in the well, the bucket and rope shall be available outside the well or into the water but it was not detected during investigation. Therefore, the circumstances available near the well and the medical evidence clearly ruled out story of accidental fall of deceased into that well. It is often seen that the offender after committing crime try to mislead the investigation and for that he either destroy the evidence of the offence or sometimes create something to confuse the Investigating Officer. Dhrub Narayan Upadhyay and Ratnaker Bhengra, JJ. 2. This criminal appeal has been directed against the judgment of conviction and order of sentence dated 19.05.2008 and 21.05.2008 respectively passed by the Sessions Judge, West Singhbhum at Chaibasa in Sessions Trial No. 163 of 2007 arising out of Manjhgaon P.S. Case No. 10/2007 corresponding to G.R. No. 145/2007 whereby the appellants have been held guilty for the offence punishable under Sections 302/34 of the Indian Penal Code and Section 201 of the Indian Penal Code and sentenced to undergo R.I. for life and to pay fine of Rs. 15,000/- each under Section 302/34 of the Indian Penal Code, R.I. for three years and fine of Rs. 1,000/- each under Section 201 of the Indian Penal Code. The appellant Naresh Jerai has further been held guilty for the offence punishable under Section 494 of the Indian Penal Code and sentenced to undergo R.I. for five years and to pay fine of Rs. 5,000/-. The sentences so passed were directed to run concurrently. 3. The prosecution case as it appears from fardbayan of Kanu Ram Jerai recorded on 15.03.2007 at 17:00 hrs. at village Kukurusud, Tola -- Kusosai, P.S. - Majhgaon, District - West Singhbhum at Chaibasa is that on 15.03.2007 at about 9:30 a.m., the informant could learn that slippers belonging to wife of Naresh Jerai are lying near a public well situated at a distance of 200 yards West to the village. The water in the well also gone dirty. The informant then collected information about the wife of Naresh Jerai and it was informed that she is not at home and the house is put under lock. Thereafter, the matter was brought to the notice of other villagers and hook (Jhhaggar) was dropped into the well in which Saree of the deceased stuck and after pulling the hook, dead body of Pani Jerai surfaced on the water. The matter was informed to Munda -- Ganga Ram Tiriya who also reached to the place and sent information to Police through Rajendra Tiriya (P.W. -2). After receiving information the Police arrived at the place, took out the dead body of Pani Jerai from the well and fardbayan of Kanu Ram Jerai (P.Ws-1) was recorded. Inquest report was also prepared at the place of occurrence. On the basis of fardbayan of Kanu Ram Jerai, Manjhgaon P.S. Case No. 10/2007, dated 15.03.2007, under Sections 302, 201 and 120B/34 of the Indian Penal Code was registered against the appellants and driver of Commander Jeep. It is also disclosed in the fardbayan that on 14.03.2007, at about 10.00 p.m., Naresh Jerai along with his brother-in-law Mangal Hembrom (appellants) had reached to village Kukurusud, Tola --. Kusosai and after parking the vehicle, both of them along with the driver of the vehicle had stayed in their house. Naresh Jerai was not happy with his wife Pani Jerai and, therefore, he had been living with his father at Kiruburu and he has arranged his marriage with another lady to whom he has kept at his father's quarter. The investigation was carried out, house of deceased Pani Jerai was inspected and certain incriminating articles were seized, statement of witnesses were recorded and the articles seized were sent to Forensic Science Laboratory for its examination. Attendance of appellants were secured but the driver of said vehicle remain traceless. Therefore, chargesheet against both the appellants was submitted after completion of investigation. Beside charges framed under Section 302/34 and 201 of the Indian Penal Code against the appellants, separate charge against appellant Naresh Jerai under Section 494 of the Indian Penal Code was also framed. To substantiate the charges, the prosecution has examined altogether ten witnesses including the informant, the investigating Officer and the Doctor and proved documents like Inquest Report, fardbayan, Postmortem Report, seizure list etc. The learned Trial Judge, placing reliance on the evidence and documents available on record held both the appellants guilty and inflicted sentence as indicated above. 4. Learned counsel for the appellants has assailed the impugned Judgment on the ground that no eye witness has come forward to prove the prosecution case. The learned Sessions Judge has erred in holding the appellants guilty on the circumstantial evidence available on record the evidence brought on record by the prosecution are not leading towards guilt of appellants excluding all hypothesis of their innocence. It is an admitted case of the prosecution that the well from which dead body of Pani Jerai was recovered, is situated at a distance of 200 yards from the house of deceased. If the deceased was strangulated in her house itself, how the dead body was taken Up to the well, is unknown to the case record. If it is presumed that dead body of Pani Jerai was carried from the house up to the well then it was expected to be witnessed by some persons of the village but no such evidence is available on record. Further more, if she was killed, it was not expected that dead body with slippers on her feet would be carried. Only because appellant Naresh Jerai was not having cordial relations with his wife, it will not be presumed that he has committed murder of his wife and threw the dead body into a well. As a matter of fact the circumstances available on record suggests that the deceased might have fallen accidentally in the well and died due to asphyxia due to drowning. By referring "Modi's Medical Jurisprudence and Toxicology", it is submitted that in few cases, death might occur from obstructive asphyxia also known as dry drowning caused by the laryngeal spasm set up by a small amount of water entering the larynx. In such a case, water does not enter the lungs and the classical signs of drowning will be absent. In the case at hand, no injury except bruise 1 1/2" x 1/4" over both sides of the neck were noticed by the Doctor at the time of Postmortem Examination. No fracture of hyoid bone was found. The witnesses including the informant have stated that water of the well got dirty and that is also suggestive of the fact that fall of Pani Jerai into the well was accidental one. The evidence collected by the Investigating Officer dose not support the circumstances brought on record by the witnesses and the injuries noticed by me Doctor during postmortem examination Since there was no apparent injury on the person of the deceased, question of oozing blood or mark of blood in the house of the deceased does not arise. The investigation conducted in the case at hand did not answer as to how blood was fallen oh the ground and how the blood mark was available on the wall, of the house of the deceased, whether it was human blood or blood of any animal. The circumstantial evidence available on record is full of contradictions and suspicion and, therefore, the appellant should not have been held guilty on the basis of such contradictory evidence. The learned counsel has submitted that the informant is none else but own uncle of the appellant. Naresh Jerai and his father were not having good relation with the informant. The village property was in jointness. Naresh Jerai and his father Sagar Jerai were living at Kiruburu in a quarter allotted by Steel Authority of India Limited. The village property was looked after by the informant. He has lodged this case leveling false allegation to put Sagar Jerai and his family members in a trouble so that he may grab their property and to some extent he has succeeded in keeping Naresh Jerai behind the bar for such a long period. The Investigating Officer has failed to trace out the vehicle which was allegedly used by the appellants on the date of occurrence. No registration number of the aforesaid vehicle has been found out. On surmises and conjectures both the appellants have been chargesheeted and the learned Sessions Judge has wrongly held the appellants guilty for the offences alleged. The impugned Judgment is liable to be set aside and the appellant deserves acquittal. 5. Learned APP has opposed the arguments and submitted that the informant is none else but own uncle of the appellant -- Naresh Jerai. It is nowhere stated that relation between Naresh Jerai and the informant was strained from before. The contention made by the informant in his fardbayan is quite natural and his conduct to find out the dead body of Pani Jerai was quite genuine and appealing. The circumstantial evidence brought on record unerringly point towards guilt of the appellant. The witnesses have stated that on. 14.03.2007, at about 10:00 p.m., Naresh Jerai along with his brother-in-law had come to his house situated Within the village Kukurusud, Tola -- Kusosai, P.S. - Majhgaon on a Commander Jeep. According to statement of P.W. -1 and P.W. -5, the vehicle was parked near house of the informant. The appellants with the driver stayed in the house of Naresh Jerai where deceased was residing. In the morning at about 7:30 a.m. they left the village, at about 9:30 a.m. slippers belonging to the deceased lying near the well were noticed by some women of the village. The matter was brought to the notice of the informant who Collected information about Pani Jerai and learnt that she is not at home and house is under lock. Thereafter, a hook (Jhaggar) was put into the well and dead body of Pani Jerai was detected. The matter was brought to the notice of Munda and then to the Police. Accordingly, the fardbayan was recorded and investigation was carried out. The Police after due investigation submitted chargesheet against the appellants. P.W. -1 and P.W. -5 have fully supported the prosecution case. Rajan Tiriya -- P.W. -2, at the instruction of Munda had gone to inform the Police and he has supported this fact in his deposition in Court. According to the evidence of Doctor, it was not a case of accidental fall or death of Pani Jerai due to drowning. The Doctor has ruled out such possibility in his evidence. Dr. Swapan Kumar Singh - P.W. -9 has conducted autopsy on the dead body of Pani Jerai and he has found bruise on both sides of the neck and the Doctor is firm about his opinion that death of Pani Jerai was due to asphyxia due to strangulation of neck. The Investigating Officer had collected incriminating articles from the house of the deceased where the appellants had spent their night falling between 14 and 15 March, 2007. The witnesses in whose presence inquest report and seizure list were prepared, have supported the prosecution case. The prosecution has well proved its case beyond shadow of doubts and there is no merit in this appeal and the same is liable to be dismissed. 6. After hearing rival submissions, we have gone through the case record, evidences adduced and documents marked exhibit by the prosecution. Admittedly the prosecution case is based on circumstantial evidence and therefore we have to scrutinize, whether circumstantial evidence adduced by the prosecution is sufficient to complete the chain pointing towards guilt of the appellants. To find out answer we have examined the evidence of informant - Kanu Ram Jerai (P.W. -1). He has stated he could learn from some woman of the village that slippers belonging to deceased are lying near a government well. He told them to find out whether Pani Jerai (deceased), is available at home or not? He was informed that house of Pani Jerai is put under lock. Thereafter, he called some more women of the village and in their presence hook was put with a rope into well. After a while saree of the deceased stuck in the hook and after pulling the hook up to the surface of water, dead body of Pani Jerai was seen. The matter was brought to the notice of Munda of the village who sent his Dakua (P.W. -2) to Majhgaon Police for giving information. The Police arrived at the spot and took out the dead body of Pani Jerai from the well. Fardbayan of informant was recorded and investigation was carried out. It further transpires from the evidence of P.W. -1, P.W. -5, P.W. -8 that appellant Naresh Jerai was not having cordial relation with his wife (Pani Jerai -- deceased) and prior to the occurrence he has arranged his marriage with another lady to whom he had kept in the quarter of his father situated at Kiriburu. What reflects from the evidence of these witnesses is that appellant Naresh Jerai instead of living with his wife in the village, was living with his father in his quarter at Kiriburu. The strained relation prevailing between the appellant Naresh Jerai and deceased -- Pani Jerai is apparent from the evidence available. P.Ws.-1, 5, 6 and 7 have clearly stated that on 14.03.2007 both the appellants on a Commander Jeep had come to the village and the appellants had stayed in his house situated in the village where Pani Jerai was residing. From the evidence of P.Ws.-1 and 4 it also transpires that in the morning at about 7:30 a.m. of 15.03.2007, the appellants left the village on said Commander Jeep but before leaving, they have provided rice beer to neighbourers. Thus evidence on record makes it clear, on that fateful night i.e. between 14/15 March, 2007, the appellants had come to the village and stayed in the house occupied by deceased Pani Jerai. In course of investigation, empty bottles of liquor sand blood spot in the room of Pani Jerai had been seen. Articles available at the place of occurrence supports that the appellants had spent their night in that very house and they had consumed liquor too. 7. Learned counsel for the appellants has been giving stress that Pani Jerai might have fallen into the well accidentally and that might be the reason behind her death and to give force to his arguments, it was submitted that slippers of Pani Jerai were lying near the well and those slippers were noticed by the witnesses. Furthermore, water of the well also got dirty. Learned counsel has also referred Modi's Medical Jurisprudence and Toxicology and submitted that in a case of dry drowning death may occur due to asphyxia and in such case of dry drowning, water is not found in lungs. To rule out aforesaid arguments, we have again gone through the evidence available on record and Modi's Medical Jurisprudence and Toxicology. Some sort of suggestions have been given to Dr. Swapan Kumar Singh (P.W. -9) but the Doctor has flatly refused to accept that such type of death cannot be caused due to fall in well or river. The Doctor has admitted that no ligature mark was found over neck. No detailed cross examination has been done to the Doctor to disprove his finding given in the postmortem report. According to the postmortem report, bruise 1 1/2 x 1/4 inches over both side of neck red in colour were found. Conclusive opinion of the Doctor is "cause of death -- asphyxia due to strangulation of neck ". In view of evidence of Investigating Officer there are two places of occurrence -- first is house of deceased Pani Jerai and second is well from where dead body was recovered. It has also come in the evidence that aforesaid well was situated 200 yards from house of the deceased and it i: pot acceptable that she had gone there to fetch water and then fell down. The dirty water noticed by the witnesses further suggests that it was not being used by the villagers. Normally in the morning hour the villagers go to fetch water from Well but it is no where stated by any of the witnesses that any villager was seen fetching water from that well. We do not agree, that availability of slippers of deceased near the well would lead to a fact that she had fallen into the well accidentally. To discard aforesaid arguments of the defence, we have given reasoning in the preceding lines. 9. To sum up the findings, we just want to connect link of circumstantial evidence which unerringly lead to a conclusion that appellants had been to the village on 14.03.2007 and they spent their night in the house, committed the offence and after causing the evidence of murder to disappear, left the village in the morning. The links of chain of circumstantial evidence are motive that appellant Naresh Jerai was not having cordial relation with his wife Pani Jerai (deceased). He was not regularly residing with her in the village rather he has arranged his marriage with another lady and kept the second wife in the house of his father at Kiriburu. The appellants had come to the village during night at about 10:00 p.m.on a Commander Jeep and they were seen by the witnesses while they were going to their house after parking the vehicle near the house of informant. They spent their night and left the village in the morning which fact found support from the evidence of P.Ws.-1, 5, 6 and 7. The place of occurrence inspected by the Investigating Officer further corroborates that the appellants had been to their house and they consumed liquor during night The articles kept in the house of the deceased were not in order rather found scattered and mismanaged. After arrival of the appellants to their house, Pani Jerai was not seen alive by any of the villagers. The postmortem report does not suggests death of Pani Jerai within 24 hours rather it suggests death occurred within 48 hours. Meaning thereby her death might have occurred between 14 and 16 March, 2007. Thus, we find that chain of circumstantial evidence brought on record by the prosecution is complete and that unerringly point towards guilt of the appellant excluding all hypothesis of their innocence. 10. We have carefully gone through the case record and we do not find any merit in this appeal and the same stands dismissed. The appellant No. 2 -- Mangal Singh Hembram is on bail, his bail bond is canceled and he is directed to surrender before convicting/successor court within six weeks from today failing, compliance bail amount shall stand forfeited and the convicting/successor court shall issue process to secure his attendance.